*No previous sliding experience is required! BCBSA holds annual physical testing sessions for all athletes interested in competing in the sports of Bobsleigh and Skeleton. Physical testing and training for Bobsleigh and Skeleton are for the purpose of having the fastest starts possible in Provincial, National and International competitions. The goal of these camps is to provide opportunities for BC athletes to get involved in the sports of Bobsleigh and Skeleton, and to evaluate the athletes to determine their potential for the competitive, or High Performance, programs. Athletes who achieve BCBSA's minimum Physical Testing Standards may be invited into the High Performance Programs after completing a Driving School. 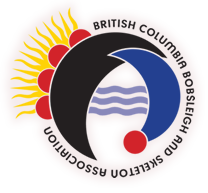 Athletes will then train and develop in the provincial system as a part of BCBSA and will have the opportunity to be selected to the Bobsleigh Canada Skeleton (BCS) National team if they meet the National Level standards. *Speed and full Strength testing will take place at this event! Minimum Physical Testing Standards can be found below as well as more information on the tests. For more information on Athlete Services from the Canadian Sport Institute Pacific, please visit their website. Attention Bobsleigh Athletes: For those athletes targeted for Bobsleigh, if you meet or exceed the Physical Standards defined below, you may be invited to a second Talent ID event to test for Power Clean, Front Squat and Bench Press. For detailed information on specific Talent ID camps please see the calendar of events, or to confirm your attendance contact info@slidebc.ca. The Canadian Sport Institute has partnered with BCS to host an Athlete Identification Camp in Whistler. It is a free one-day camp testing athletes' capacity for sport performance at its highest level. For more information, please visit CSI Pacific's website. For an athlete to be considered part of the BC Development or High Performance Program, they must meet or exceed 4 of BCBSA’s Physical Testing Standards listed below. CSI-Pacific outlines the requirements and services available for athletes on their website. These scores are reflective of an athlete that is under 23 years. Older or significantly younger athletes may be subject different standards at the discretion of the coach (taking into account CS4L stages). Please visit www.youtube.com/user/CanadaBobsleigh for video explanations of each test event. Some information has not been defined yet or is unavailable. BCS standards were taken from the BCS website (www.bobsleigh.ca).